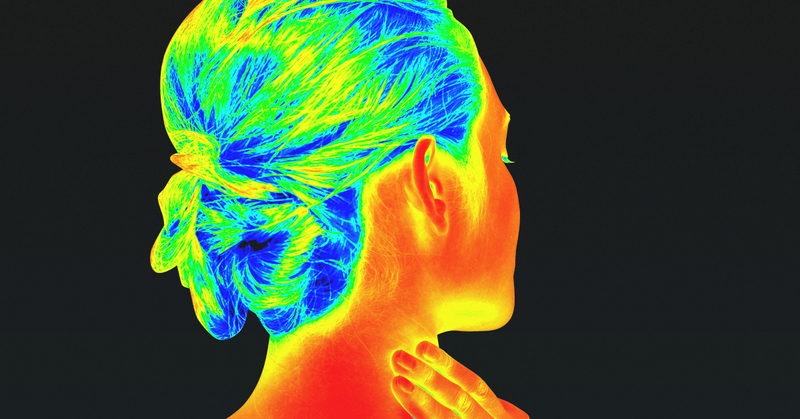 Thermographic cameras work by detecting heat that naturally emits from the body and also provides a visual for inflammation in the body. Inflammation is the first sign of degenerative diseases, such as cancer, arthritis, heart disease, diabetes, fibromyalgia, autoimmune disease, thyroid issues, and other chronic health conditions. Early detection of this inflammation may help you to develop a health plan (lifestyle change) to prevent those health conditions from even developing in the first place. Thermography is very safe, non-invasive with absolutely no radiation and no-touch. There’s no poking or prodding when you get a thermogram. It’s just an infrared camera that takes photos of your body. That’s it. There’s absolutely no pain involved. Thermography is incredibly accurate. Studies have shown it to be effective in finding early signs of breast cancer up to 8-10 years before other standard cancer detection tests. It has been shown to be 97% effective at detecting benign vs malignant breast abnormalities. What a difference this makes with breast cancer and possibly other cancers, heart disease and other chronic health conditions. You can actually make changes to your diet and lifestyle before the condition develops. Thermography has been recognized as a viable diagnostic tool since 1987 by the AMA council on scientific affairs, the ACA council on Diagnostic Imaging, the Congress of Neurosurgeons in 1988 and in 1990 by the American Academy of Physical Medicine and Rehabilitation and is FDA registered. The primary way that thermal imaging works is by detecting temperature variations related to blood flow and demonstrating abnormal patterns associated with the progression of tumors. When the body is viewed through a thermal imaging camera, warm areas stand out against cooler areas, and changes in patterns can be tracked over time. Because cancer cells are growing and multiplying very fast, blood flow and metabolism are higher in the areas near a growing tumor, which means skin temperature near these locations increases. Currently there are two types of thermography scans offered: half (upper) body scans and full body scans. Both scans include the breasts. The scans are pain free, fast, radiation free and non-invasive. This screening includes images from the top of the head to just above the pubic bone. It includes everything in the head and neck and breast screenings plus the torso but not including arms, hand, legs and feet. Thermography can aid in the assessment of various dysfunctions, diseases, and other concerns in the upper body to include: Lymphatic Congestion, Digestive Disorders, Breast Health, Kidney and Liver Dysfunction, Thyroid and Adrenal Gland Dysfunction. Breast Scan: Breast thermography is a 15 minute non invasive test of physiology. It is a valuable procedure for alerting your doctor to changes that can indicate early signs of complication in the breast. Complications such as: Cancer, Fibrocystic Disease, and Infection. This screening includes images from the top of the head to the bottom of the feet. It includes everything in the half body screening plus all extremities. Thermography can aid in the assessment of various dysfunctions, diseases, and other concerns in the lower body to include: DVT – Deep Vein Thrombosis, Gout, Thoracic Outlet Syndrome and much more (see conclusion). Step 1: You will be placed in a temperature-controlled room to allow your body to regulate to normal core temperatures. During that time, you’ll be asked to complete some simple paperwork, including a health survey. Step 2: You will be positioned in front of a Thermal Imaging Camera, and from there the technician will take digital images. This relatively short process can take anywhere between 5-15 minutes. You will be able to see yourself “live” on the computer screen, which would allow for a better personal understanding of your body. Step 3: Your pictures are sent out to a certified physician for analysis of 1) the amount of heat and 2) the symmetry of the heat patterns. Heat patterns may indicate inflammation, infection, or a variance from your body’s norm. Step 4: You’ll receive a report with your images within 24-72 hours thereafter via email. This will help you and your primary care physician determine any next steps. We also provide recommendations for ways to reduce inflammation (if present) and provide personal health and wellness coaching programs if desired. While it’s been researched most extensively for its role in detecting breast cancer, the benefits of thermography can also be applied to the rest of the body. Overall thermography can be used for: Breast health, Deep vein thrombosis, Dental pathologies, Diabetes, Digestion and colon function, General toxicity, Immune and lymphatic system function, Inflammation, Joint health, Lung and heart health, Nerve health, Pain, Sinus infections, Thyroid health, Visceral health (liver, pancreas, spleen and stomach), and much more! 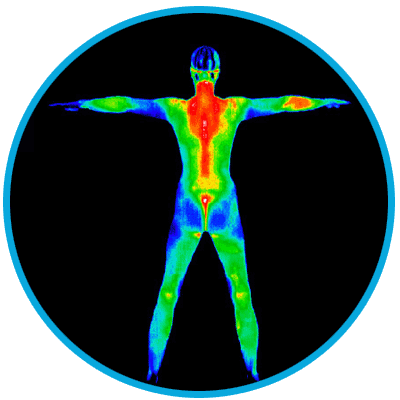 Whether your pain, condition, or disease is acute or chronic, a thermography scan can help you provide your healthcare professional with the information needed to effectively get you back to better health and wellness. Thermography offers an alternative method of detection long before you may feel any symptoms or be diagnosed with an actual disease. With this revolutionary innovation, Thermography may prove valuable on your road to a healthier you!